The John Deere E-Cut Hybrid Fairway Mowers take high-performance hybrid technology to the next level. The E-Cut Hybrid technology uses a 48-V alternator to power the cutting units via electric motors, eliminating all hydraulic leak points from the reel circuit, where 90 percent of all hydraulic leaks occur. In addition to the elimination of leak points, the E-Cut Hybrid Fairway Mowers can be set through the TechControl display to automatically operate at a reduced throttle of 2300 rpm for noise reduction, as well as fuel savings up to 30 percent as compared to hydraulic units. Electric reel drive system eliminates all potential leak points in the reel circuit. Easily accessible daily service points mean less maintenance time and more time working . eHydro™ hydrostatic pump and large-capacity wheel motors for serious hill-climbing capabilities. AutoPedal™ feature lowers sound levels and fuel consumption during transport. Larger, 63.5-mm (2.5-in.) 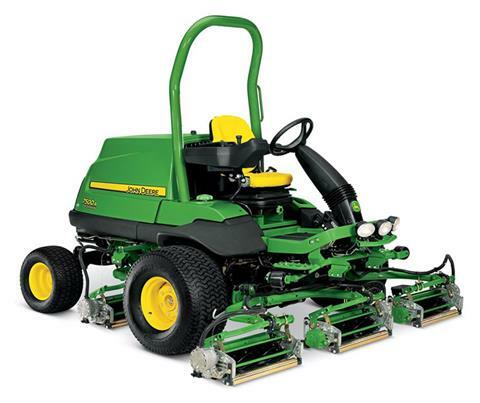 front grooved disc roller compatible with Fairway Tender Conditioner (FTC) and Greens Tender Conditioner (GTC) attachment for 22 In. (55.9 cm) Quick Adjust 5 reel cutting units. Tires sized for proper weight distribution and a low ground pressure. Cutting units are stable and fold inside the front tires for easy transporting. GRIP All-Wheel Drive Traction System provides superior traction by reducing wheel slip. MTSpiral and MTGrooved roller options for most any turf condition. 48-V, 180-amp alternator powers reel drive motors, requiring no additional batteries on unit. Reduced sound levels and fuel consumption at 2300 rpm. Double-acting, single-rod hydraulic steering cylinder for lines on fairways as straight as a greens mower. Brushless electric reel motors for compact design and optimal efficiency.